As part of the maintenance process, City crews occasionally flush the water mains in various areas of the city. Occasionally this causes a slight and temporary discoloration in the water. The water is completely safe, and we advise that you simply open your COLD water faucet and allow the water to run for several minutes to clear it out. If water discoloration persists for an extended period of time, call Water Quality at 720-898-7802 or Water Treatment at 720-898-7820. Each year when freezing temperatures no longer pose a threat, Arvada Utility personnel hit the streets around the City to flush water mains. The purpose of flushing is to help maintain water quality in water mains, especially where limitations in the distribution system create potential quality issues. During dry years, this water release may seem like a waste. In reality Arvada only flushes about 0.1% of its total annual consumption. During flushing, customers may notice water in the street as it enters the storm drain system. To conserve water, the City performs unidirectional flushing of the water mains, which uses significantly less water than conventional flushing. We achieve this by isolating flush runs, which increases water velocity. Part of the flushing program includes flushing the fire hydrant system, which ensures they are working properly. How often does this flushing occur? It takes three years to completely flush the entire water system. Currently the City is divided into three somewhat equal parts with 1/3 being done per year. These flushing operations are typically done in the summer months. When I get discolored or cloudy water what does this mean and who should I call? Generally speaking the dirty or brownish looking water is caused by some sort of maintenance or construction operations in the area that has stirred up sediment in the water main lines. The milky or cloudy looking water is typically from air in the water from construction work. Neither of these conditions is cause for alarm, but should be reported to the Utilities Department at 720 898-7760 or after hours, weekends and holidays at 720 898-7820. During the late fall and winter months when use is at its lowest, low-flow water areas invite two potential problems. The first is that the water begins to go "stale," meaning that the unused water slowly begins to lose its chlorine residual. Since the chlorine that Arvada adds to its water prevents bacteria growth in the system, it's important to flush out those areas before the chlorine levels drop below minimum standards. "Stale" also describes the taste and odor occasionally associated with water in these low-flow areas. The longer water sits in the main, the more it may absorb the "flavor" of the pipe itself. This can be particularly apparent in newly-built neighborhoods, especially those with PVC water mains, where mains haven't had time to develop the slight mineral build-up that coats their inner surface and separates the pipe material from the water itself. That build-up leads to the second problem. The very same minerals–iron and manganese primarily (rust, really)–that can help in a thin coating are a nuisance in larger amounts. They tend to build up excessively where there is the least water use. While the minerals provide no health risk, they can cause sediment problems when use picks up again. All of the sediment that has settled in the pipe during the cooler months is stirred up once customers begin using more water. Since there's nowhere else to go, the mineral deposits pass into customers' service lines and may end up in hot water heaters, faucet aerators, and, unfortunately, in a glass full of rust-tinted water. If left untended, the minerals will continue to build up in the water main and eventually impede its water flow and carrying capacity. Arvada tries to flush water mains during normal business hours to reduce noise complaints. However, there are sites that need to be flushed after hours because of possible impact on traffic or safety concerns for the flushing crews. 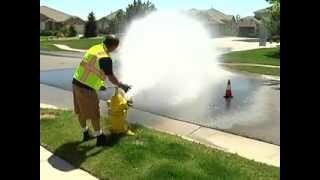 To report a water break or sewer backup after hours or on the weekend: 720-898-7820. To report a water problem electronically, 24/7, use Ask Arvada.